The college semester is back in session, and our church is seeking to minister to the flood of students who descended upon the liberal arts college a couple of blocks down the road. At 30, I am already beginning to feel that drift, as the gulf of experience between me and these young men and women slowly widens. The ocean tide of aging is gently pulling me further and further from my years in college. However, greater distance often gives greater perspective. I have come to the place as an adult where I am ready to issue my first “Do as I say, not as I did” statement. Here goes: I was a lost pinky toe in college; don’t be a lost pinky toe. A Toe With No Body. I was one of those students who was involved in all kinds of Christian activities. I was the chaplain of my fraternity. I was a part of service organizations. I was involved in discipleship with men on my soccer team. I attended chapel. I read my Bible. I attended a local church every Sunday. But when it came to actually being a member of a local church, I was a severed pinky toe. I didn’t join a church. As a pastor, I now realize what I wished I had then: there is no time off from the local church. College is a weird time in a Christian’s life. You spend eight months in a foreign town, you go home for a month at Christmas, and during the summers you try your best to hold down whatever work you can as a landscaper or camp counselor. It’s hard to know what to do. Most students probably remain members at their churches back home. That’s what I did. And I regret it. If you are a college student, you know what I’m talking about. College is your new home. For four years you spend your energies, your money, your time, your life, everything at school. When you go home, it’s just to visit the family, see some old friends, and get some work in before you can go back to real life at school. Here’s the question: Why do we invest every other part of ourselves in our new college community, but we won’t join a local church body? I suspect part of it is sentimentality. We grew up in our home church, and we don’t want to make that break with the membership there. I’m not pretending it’s easy to leave a home church. Paul himself wept when he parted with the Ephesians in Acts 20:36-38. True love among brothers and sisters means there will be tears whenever God takes us to another place. However, when you move on from college to launch into the world, will there be a local church to weep with you at graduation? Will there be genuine brothers and sisters that you have come to love who will be there to wave goodbye? Will there be a church that remembers the four years you served them as a member of their local congregation to further Christ’s Kingdom? Every Part Is Meant to Serve the Body. In Romans 12, Paul calls Christians to present their bodies as a living sacrifice. He continues in verses 5 and 6 to explain: “so we, though many, are one body in Christ, and individually members one of another. Having gifts that differ according to the grace given to us, let us use them.” Every Christian, including those in college, has spiritual gifts that God intends for him or her to use for the benefit of a local church. In 1 Corinthians 12, Paul explains these same truths to the church at Corinth. He emphasizes the fact that the members of a local church have different functions–one an eye, one an ear, one a hand. Again to the church in Ephesus, Paul emphasizes that the church body is being built up to mature manhood in Christ Jesus. This happens as “each part is working properly…so that [the body] builds itself up in love” (Eph. 4:16). So, college student, where is that happening for you? 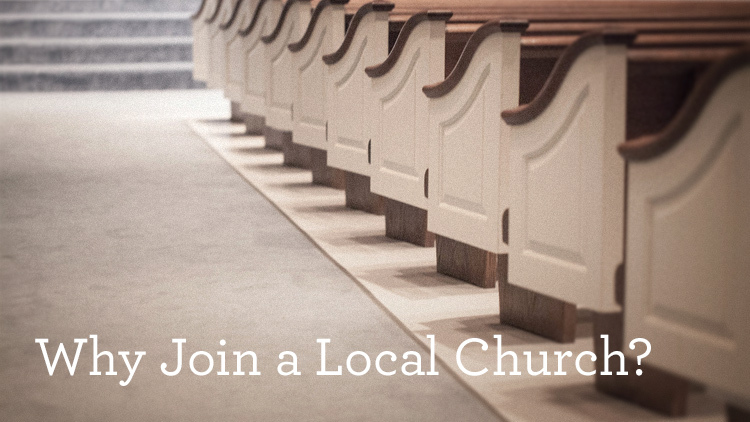 What local church body is benefiting from your spiritual gifts? Into what local church are you being knit as the pinky toe, the ear, the eye, or the pancreas? If you refuse to join a local church while you are at college, you are choosing to allow “church” to remain a cloudy theory. True Church happens at a church. “You might be content for the whole idea of ‘church’ to exist in your head. But Jesus wasn’t so content. He wanted his church and your membership in it to show up in real-time. As such, you cannot fulfill your obligations to other Christians and to church leaders without the local church, at least not in the way Scripture calls you to fulfill them. And other Christians and church leaders cannot fulfill their obligations to you without the local church. You need a body of Christ to be the body of Christ. You need a family of God to be the family of God” (73-74). I am sorry to Covenant Orthodox Presbyterian Church for being a selfish Christian consumer all four years of college, choosing not to invest my spiritual gifts for the growth of God’s people. I wish I had had a church to weep with me on graduation day. I was a lost pinky toe. Don’t let that be you. Previous Post New Articles at CAPC and FTC! I was in the same boat you were in. It wasn’t because I didn’t want to join, but the thought didn’t even cross my mind. In my case I’ll plead ignorance. There are many benefits to joining a church, not only in what you ‘get’ but what you can give to the body. And I agree that Covenant was a fantastic church throughout my four years at the Grove. Yes, let’s get together. I’m pretty busy with the new baby and college soccer starting up but I’m sure there are a couple weekends we can get together. Our local church has an associate membership which allows you to keep your home church’s membership but also be a “temporary” member at our church (mainly for students). Do you have anything like that? I’ll be honest I don’t know much about the details of it, but I could get some if you would be interested in reviewing. I’m familiar with watch care membership, and I think it’s a viable option for some churches. My hope is that this article might help even a few students start doing more than just attending church while they are at college for four years. P.S.- now that EPL is on NBC, we have no excuse not to get together soon!